IdeaFestival®, a leading celebration for creative thinkers and the intellectually curious, announces that event tickets are now on sale. IdeaFestival® 2016, a leading celebration for creative thinkers and the intellectually curious, announces that event tickets are now on sale. The Festival boasts numerous speakers and performers who will inspire, entertain, promote and encourage the cross-fertilization of ideas and innovation from Sept 27th-30th, at The Kentucky Center for the Performing Arts. Festival Passes are now available at the early bird rate of $350. This leading four-day event brings together an impressive list of emerging and well-known influencers from a variety of disciplines including science, the arts, design, business, film, technology, education and much more – all working towards the convergence and exploration of how ideas shape our future. Troy Carter - Founder, President and CEO of Atom Factory, a diverse entertainment company with roots in talent and investments. As a digital social entrepreneur, he helped define the career of multi-platinum Grammy winning artist Lady Gaga. Susan Schneider - Philosopher and cognitive scientist, will discuss her fascinating work with NASA that explores the question: "If we encounter a highly advanced alien consciousness what might it 'look' like?" Alan Lightman - American physicist, writer and social entrepreneur. He is a professor of the practice of the humanities at the Massachusetts Institute of Technology and the author of the international bestseller, The Accidental Universe: The World You Thought You Knew. Kim Phuc - Girl in the iconic Pulitzer-Prize winning Vietnam War photo depicting children in flight from a napalm bombing. She is the subject of the book The Girl in the Picture and a documentary entitled: Kim’s Story: The Road from Vietnam. Tickets for IdeaFestival’s annual kick-off day, Thrivals 9.0, are also available as an addition to a Festival Pass purchase for only $49. Thrivals is a future focused, innovative learning experience that sets the tone for the IdeaFestival each year and caters to broad thinkers of all ages with a focus on high school and college students. Thrivals 9.0 will be held on Tuesday, September 27th, 2016. Please visit ideafestival.com for more information and to buy tickets. Stay Curious™! The conference is held every Fall in Louisville, Kentucky at The Kentucky Center for the Performing Arts, a beautiful and historic venue that houses artworks by such 20th century masters as Joan Miró, Jean Dubuffet, Louise Nevelson, John Chamberlain and Alexander Calder. 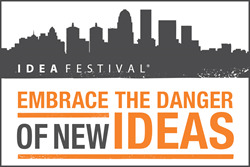 The setting, thought-provoking sessions and informal tone make IdeaFestival a truly unique experience. Those who attend leave the event with interesting new ideas, a better sense of connectedness, an expanded network of relationships and lasting inspiration to help create change in the world. Please visit ideafestival.com for more information. Follow us @ideafestival and #IF16.